OK, I know! Mel Gibson doesn't star in this movie, but he is the writer, director and producer - that's why it is included here. This movie has a cast of unknowns but is an amazing movie and deserves a place here. 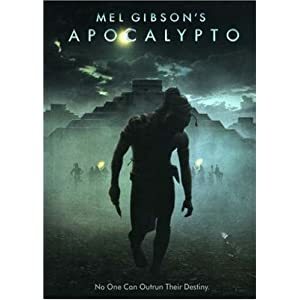 Mel Gibson's Apocalypto is filled with bloody action and gore, coupled with an engaging story that will keep you on the edge of your seat. This film focuses on a young man named Jaguar Paw. He and most of the able-bodied men that survived from their village were taken captive by a much more powerful tribe. They will be taken back to the great Mayan city to become slaves or ritual sacrifices. Jaguar Paw manages to escape before getting his head chopped off, thanks to his painful need to come back to his wife and son who survived the slaughter back home. I saw this movie in the theater with my husband. We were both wondering how it was going to end. I don't want to spoil it for anyone, but I'll just say that it really surprised me. The story really pulled me in. It's hard to believe people could be so cruel to each other. I guess that's how it has been throughout history, though.